OHDR’s Native American Research Outreach (NARO) team recently visited the Red Lake and White Earth reservations in Minnesota to facilitate preliminary data collection for a community-based participatory research (CBPR) proposal that has since been submitted by the two tribes, the Indian Health Service (IHS) and Mayo Clinic. 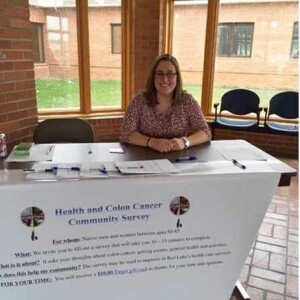 The proposed project intends to increase colorectal cancer screening participation. 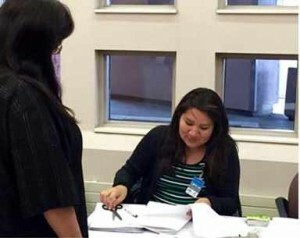 Three Mayo representatives and a contract liaison employed by one of the tribes conducted surveys at each tribe’s IHS facility and at one tribal senior living facility. The team also delivered surveys to IHS health care providers. The goal was to collect 40 community surveys from each reservation, but community willingness to participate was so high that the teams collected 89 surveys in one and a half days. IHS providers returned an additional 16 surveys. Thanks to the community members and providers who participated, and to the NARO team, the tribes and Mayo Clinic successfully submitted their R01 grant proposal to the National Cancer Institute (NCI) on May 4, 2015. The proposed study will explore multiple avenues for increasing colorectal cancer screening participation on the two reservations. Native Americans in the Plains and Alaska have higher rates of death from colorectal cancer than do members of the general U.S. population. Finding the cancer at an early stage may help improve the chance of survival.